An Interview with Jeffrey Richelson. · One Book. One Author. One Hour. 1:32 – How did your book come to be on Booknotes? – Richelson’s book was a last minute addition to the program because he is an expert in the CIA and his appearance was slated for five days after the attacks of September 11, 2001. 2:13 – How did you prepare for your appearance on the show? – Because of the unique circumstances surrounding Richelson’s appearance on Booknotes it was a joint interview with author James Bamford. This did not change how he prepared for the show because they were not meant to be delivering a joint presentation, instead they were each talking about their books and the expertise as it related to the situation. Richelson re-read his book to prepare. 2:55 – What do you remember most from your appearance on the show? – The question about the “acoustic kitty” stands out because he had been asked about that program in other interviews. 3:17 – What are the benefits or drawbacks for the longer format interview for the author and for the audience? – There are no drawbacks for the author because you get to talk in more detail about your book and get asked a broader range of questions, making the longer interview more reflective of your book. The person who questions you in this type of format would be more prepared. 4:25 – Your appearance was live and was followed by a special call-in segment. What was your experience with the call-in portion of the show? – Richelson did not even remember these details. At that time he did a number of interviews and many of them had call-in portions. No questions stand out. 5:28 – Do you find this kind of preparation to be normal for interviewers and how did it change the interview experience? – This amount of preparation is not normal. There are circumstances where interviewers are just as prepared, such as at public library events, but usually an interviewer will not have read the book and will only have a few minutes do deal with your subject matter. 6:54 – Were you surprised to be asked biographical questions and is this normal for other interviews you have experienced? – Biographical questions are unusual and Richelson thinks that these are made possible by the interview’s length. 7:34 – Were you surprised by any of Brian Lamb’s other questions? – Not really. All of the questions were the type of questions you would want someone to ask about your book and under these circumstances. 8:25 – Did you watch Booknotes before or after your interview and did your experience on the show change your opinion of it? – Richelson has watched the program selectively over the years depending on the author and topic. Appearing on the show did not change his perception of it. 9:08 – If given the opportunity, would have preferred to have a more traditional interview? – Richelson would have preferred if 9/11 did not happen but did not mind appearing on the show with another author. He thought that they both brought lots of good information about their issue areas which worked together. 10:04 – What do you think the benefits and uses of the Booknotes Collection might be? – This could be useful for someone writing the history of C-SPAN or Booknotes. 11:08 – If asked back would you have appeared for another interview? – Certainly. Other interviews are like book reviews because they are so limited in the space you are given to talk about a book. But on Booknotes you can talk at length about your book. 12:12 – Was there a difference in sales or national attention for your book after appearing on Booknotes? – There is no way to track this since his book came out so soon after 9/11 and because he was involved in a book tour. 13:30 – Did your experience on the show cause you reevaluate any of your own assumptions regarding your research or writing methods? – Not really because he had already written several books at this point so he was settled into his strategy of writing chronological narratives based on interviews, freedom of information requests, archival research, and secondary literature. 14:21 – What have you been working on since this book and what works are you most pleased with? – He has written several scholarly articles on intelligence and the books Spying on the Bomb and Defusing Armageddon. Spying on the Bomb was his greatest challenge because of the scope of the book. In some ways Wizards of Langley, which he discussed on Booknotes, was his favorite book because he felt very connected to the subject matter. 15:54 – In your estimation what has been the lasting impact of Booknotes? – Richelson has no idea and thinks this is for the person who writes the history of the program to figure out. 16:30 – Is there anything else you would like to add? – Richelson thinks it is great that Lamb undertook this program and found it to be a great experience. The program is a good contribution to intellectual history and he is glad that it went on for so long. 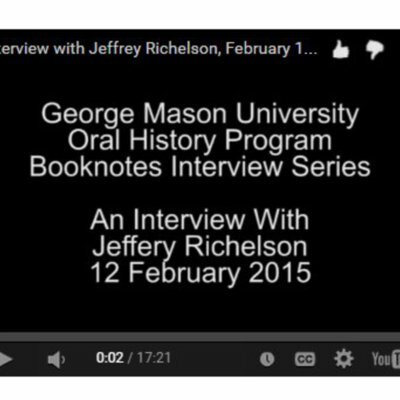 Lindsey Bestebreurtje (Oral Historian), “An Interview with Jeffrey Richelson.,” One Book. One Author. One Hour., accessed April 24, 2019, http://booknotes.gmu.edu/items/show/2785. Booknotes Oral History Series. R0143 Box 02 File 11.